The main deckhouse and ventilation is done. Below an illustration by Pierre Hervé. 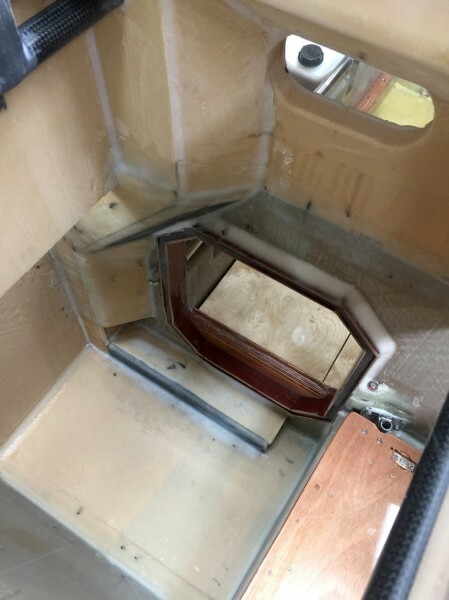 In bad weather a mixture of air and water enters the ventilation cowl, like in a Dorade box the water is separated. In Exlex there is a water seal, like in the drain pipe under a sink. 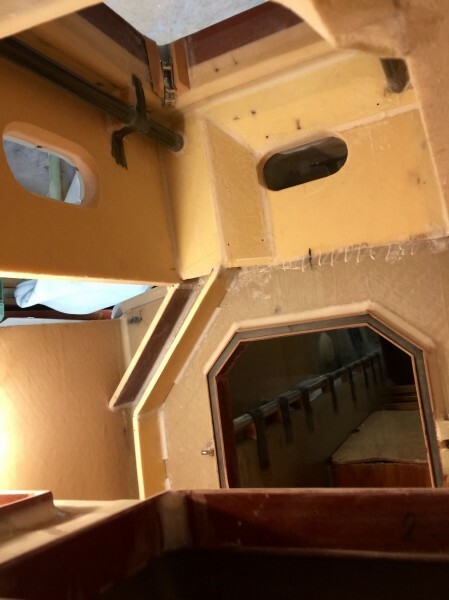 Thus all the air is ducted to the inside of the boat. 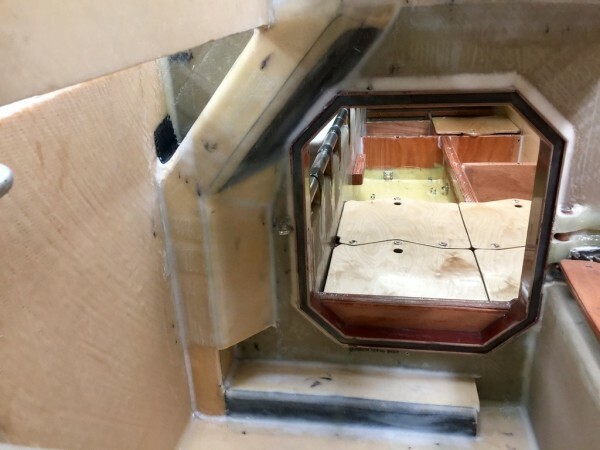 The Dorade box has a large volyme compared to the diameter of the cowl – if one can compare a surface to a volyme – should plenty of water come. As a back up there is a secound large volyme box. The clean air now descends through a channel to the bottom of the boat, then crosses to the opposite side. 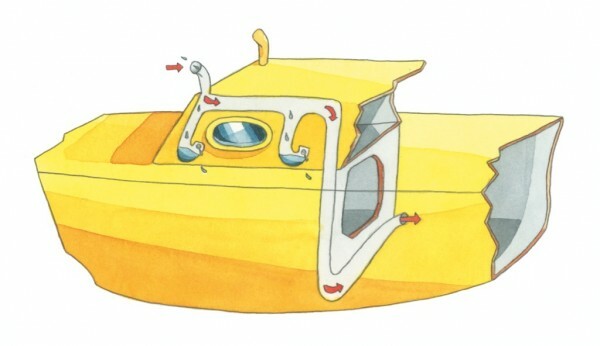 When the boat capsizes there is always some part of the ventilation system above the sea surface and as water cannot rise above its surface no water will enter the boat -same principle as in a centerboard case. Some water that has entered the ventilation system may drain in the navigation cabin/ lunch room where it is harmless and will be taken care of by kajak pump. There is a mirror image of the system on the other side. One side for incoming air the other for used outgoing. due to space restrictions I do like to have the crossings in the same plane therefore one system is crossing at the deck level the other at the bottom level. Therefore the two vertical channels are on the port side. Vieuw from hatch. The two inlets one on each side. Viuw from aft window looking into sleeping room through waterproof hatch. The main deck house. 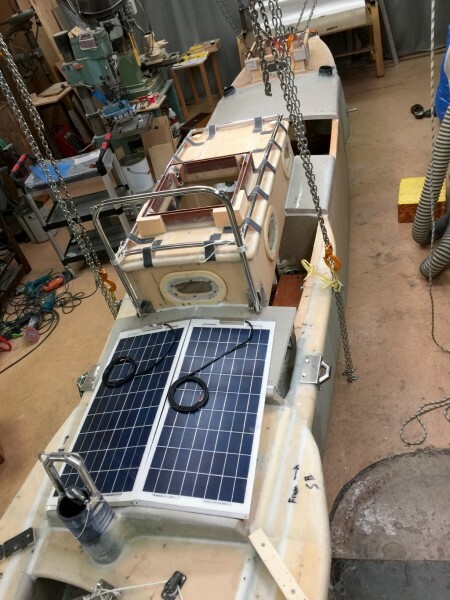 The solar panels are temporarily there.